Tick or un-tick items in the list to activate the selected Background Automation. Edit. Edit the selected Background Automation. Calls the 'Automation Settings' dialog below. New. 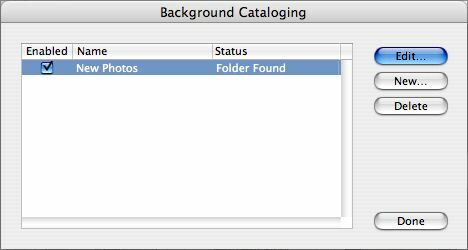 Create a new existing Background Automation. Calls the 'Automation Settings' dialog below. Delete. Deletes the selected Background Automation. Name. The name used in the Background Cataloging dialog list. Folder to Watch. The folder to be watched for changes. Tick box sub-option to include its sub-folders in the scope of operation. When Synchronising the Catalog with the Folder. Choose whether to show the Cataloging Status dialog during the synchronisation process. 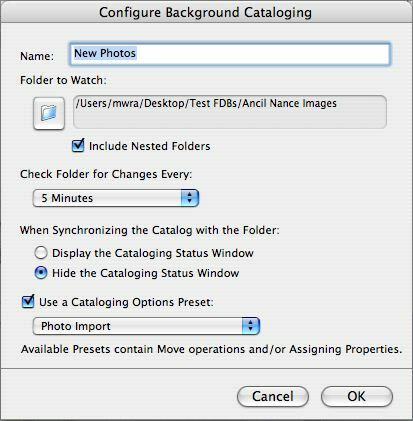 Note that the ability to tie in a set of cataloguing options to a background session allows you to set up a number of different procedures each, for instance, based on a different hot/drop folder.